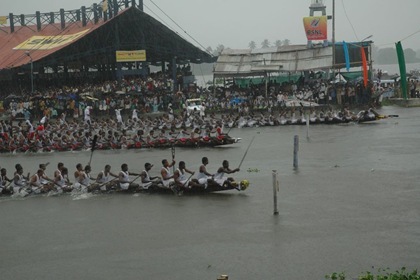 The 56th Nehru Trophy Boat Race 2008 is scheduled to start today, on August 09 at the Punnamda Lake near Alappuzha, Kerala, India. This event is a major tourist attraction during this weekend. Every year the race is conducted on the second Saturday of August. This year 16 snake boats are expected to take part in the 1,360 metre race. The snake boat has about 120 rowers and the length of the boat varies from 120 to 140 feet. Also for the first time an all-women team comprising 116 women is participating in the event to row a 115 feet long snake boat. More than 300,000 visitors are expected to witness the race. Here is a multimedia photo documentary on the Nehru Trophy Boat Race 2007. Here is one more video clip. For more photographs and information on 56th Nehru Trophy Boat Race 2008 log on to Nehru Trophy. 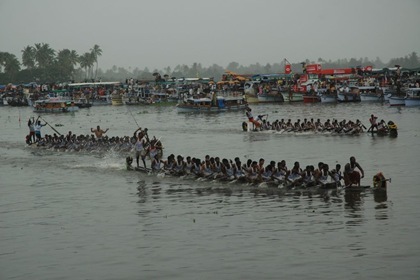 Karichal Chundan’ snake boat of Kollam Jesus Boat Club, won the 56th Nehru Trophy Boat Race 2008 in the boat race held at Punnamada lake on Saturday, August 09. Read more from The Hindu. Video clips of the event are here and here.